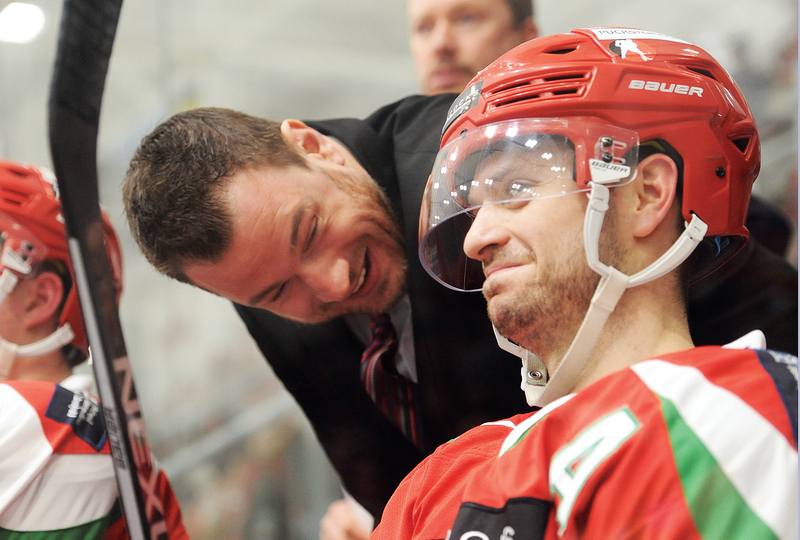 Devils head coach Andrew Lord shares a joke on the bench. Cardiff Devils face a Scottish Elite League title trial with two trips north of the border in the next five days. Reigning champions and leaders Devils take on Glasgow Clan away this evening, while they head back to Scotland on Sunday for a clash with Dundee Stars. Between those crucial fixtures, Cardiff play Manchester Storm at the Viola Arena in Cardiff Bay on Saturday (7pm). By the time Devils head back from Dundee they will have two regular season League fixtures to play and head coach Andrew Lord says: “They’re all big games and that’s what makes this league so exciting. Belfast Giants are two points behind Cardiff and the only team who can still catch the leaders. Both clubs have already qualified for net season’s European Champions League. Clan v Devils tonight (Wednesday) is being broadcast live on FreeSports television from Braehead. Cardiff’s record in Glasgow is good, having not lost there since January 2016. The Devils have won every League meeting between the sides this season, although they lost in the Challenge Cup return leg in Wales which saw them knocked out. For Clan, already assured of a play-off place, this is their game in hand on Nottingham. A win would put the Scottish side back into third place overall. “We have four games left and if we keep playing like we did in Cardiff we’ll earn more puck luck and win games,” said Clan coach Peter Russell. Devils’ loss in Sheffield took away their safety net ahead of Belfast, who hold the tie-break with more overall wins. Devils’ Predictorbet play-off quarter-final home fixture will be played on Sunday, April 7 (6pm). Cardiff do not know yet who they will face in the quarter-finals, but they have confirmed the home game at their Viola Arena home is on the Sunday. Season ticket holders have until noon on Monday, April 1 to purchase their normal seats. After that, all unsold seats will be released for general sale. Normal season ticket seats can be purchased in person at the Viola Arena main reception or by calling the box office on 0800 0842 666. Season ticket holders will receive £2 off the regular matchday prices and will not be charged a booking fee. Non season ticket holders can buy tickets by ringing the box office on 0800 0842 666, in person at Viola Arena or online by CLICKING HERE. Cardiff Devils playmaker Charles Linglet.